Experienced Accounting Clerk with strong clinical abilities and a successful career in both the Automotive and Retail fields. Proactive and organized with passionate commitment to first-rate work done. Goal-oriented, dedicated to high qualities of work, and meeting aggressive business goals. Able to lead, train, and motivate associates/co-workers; produce in high volume areas; oversee a wide range of responsibilities; able to pay attention to specific details, and exceed expectations; general clerical skills; Data Entry; administrative procedures, answer phones, filing & record keeping; problem assessment & solving; proficient in Micro Soft Offices, MAC, PC; 45wpm, 10-Key, Payroll entry, some knowledge of Quickbooks, Bookkeeping; Scheduling, Strong customer Service orientation; works well independently or with a team. Research, evaluate, and negotiate w/ suppliers based on price, quality, selection, service, support, availability, reliability, production and distribution capabilities; and the supplier's reputation and history. Calculate and prepare checks for payments. Design display managers and discuss their implementation w/ supervisors. 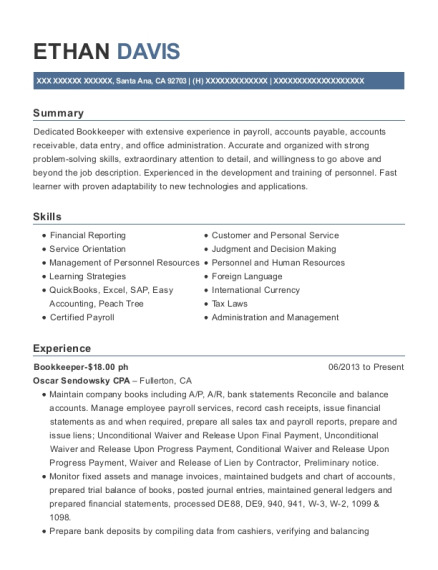 Review time sheets, work charts, wage computation, and other information to detect and reconcile payroll discrepancies for payroll entry. Hire employees and process payroll entries. Merchandise specialty stores with current trends Restock, steam, and receive shipments, Inventory Control Received company's highest sales award three years in a row Developed excellence in sales training course Special Events Planner Telephone sales, Weekly reports (sales analysis). AA: Liberal Arts Jan 2003 West Los Angeles College - Culver City, CA Courses taken in the Business Administration concentration. 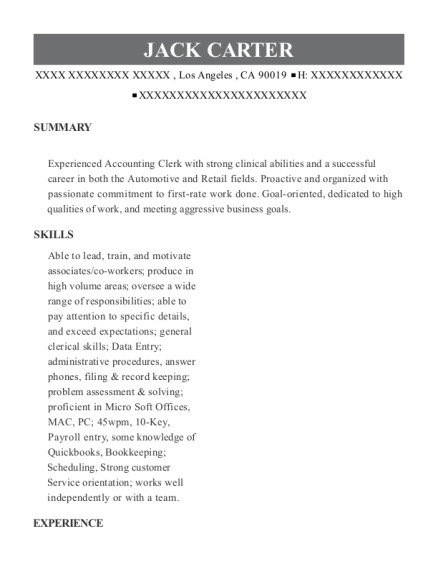 This is a resume for a BOOKKEEPER in Los Angeles, California with experience working for such companies as Suesettes Family Child Care and Nick Alexander Imports. 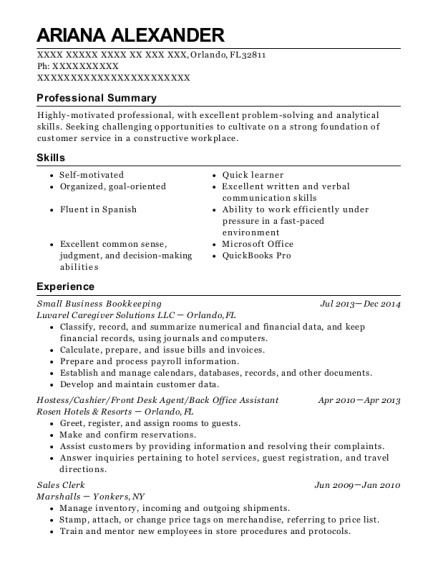 The grade for this resume is 0 and is one of hundreds of BOOKKEEPER resumes available on our site for free. 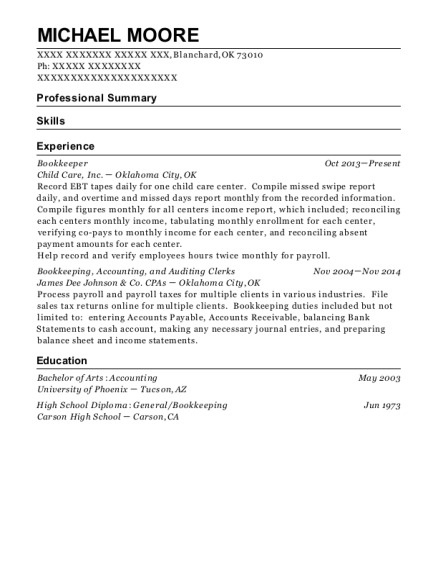 Use these resumes as templates to get help creating the best BOOKKEEPER resume.